Share the post "CFD Leverage & Forex Leverage – You Must Understand This or You Will Blow Your Account"
CFD leverage is the main reason traders are drawn to trading CFDs and Forex. CFD leverage allows you to use your current cash and trade on margin. Effectively, you only need a small amount of capital to control a much larger position. Just think of your leverage like buying a home. You would place a 10% deposit to secure the full purchase price of the home. For example, on a $500,000 home, you need a $50,000 deposit or 10% to secure it. From here you will make payments until the house is paid off. If you wanted to purchase $300,000 worth of blue chip stocks on the Australia market, you would need around 10% as margin or $30,000. This is where CFD leverage comes in. In simple terms, your CFD broker or Forex broker is ‘lending’ you the total amount. If your house were to rise 10% to $550,000, then you would be sitting on an open profit of $50,000. When we consider your ROI (Return On Investment), you made $50,000 gain with an initial investment of $50,000. This equates to 100 percent return cash-on-cash. That is how we calculate our return on investment when trading CFDs as well. The ability to access more funds has allowed many traders to multiply their profits. On the other side of the coin, traders using leverage have also magnified their losses. When Trading CFDs you must be careful not to over leverage as this is the fastest way to wipe out your trading account. For all traders, CFDs as a double-edged sword in that regard. What you must realise is that You control the amount of leverage in Your account. 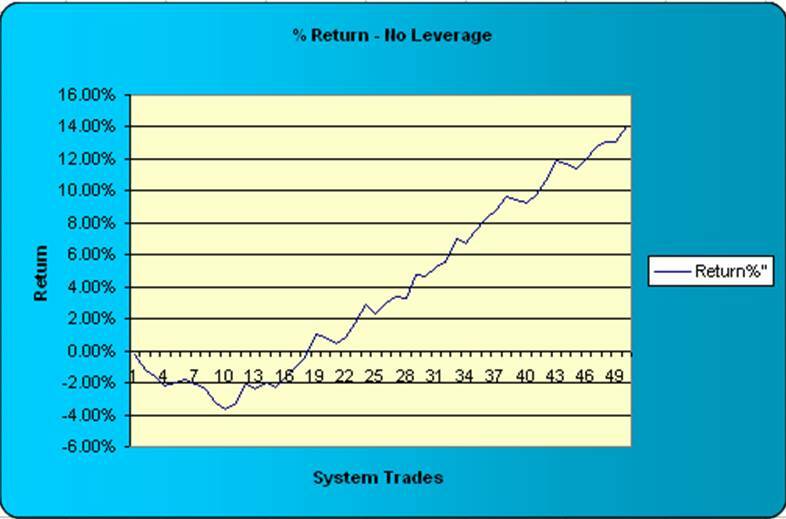 You control the amount of LEVERAGE in your trading account. What this means is the total exposure you have relative to your account size is up to you. People who trade at more than ten times leverage are gambling their trading account. So if you had $10,000 cash you could access up to say $100,000 or even $200,000 worth of positions. If the market moved 5% against your $200,000 in positions, then you have just wiped out your account. So much for that round-the-world 5-star holiday. Trading at more than ten times leverage is suicide for your trading account. Unfortunately, this scenario happens all too frequently when people open a Forex trading account. They often get access to up to 400 to 1 leverage. For some reason, they believe this gives them the right to max out the leverage on their account. You are running way too close to the knife’s edge. And that is not a good thing. You need to have a huge respect for the amount of leverage you are using on your account. So how can I use CFD Leverage is a sensible way? The smartest way to get started is to trade very small and ensure your leverage does not exceed three times your account size. If you have $10,000 cash, then make sure you don’t take positions that total more than $30,000. If you have $10,000 cash, then make sure you don’t take positions that total more than $30,000. In fact, you are best off starting with ZERO CFD leverage just to dip your toe in the water. If you have $10,000 in cash, then don’t take positions that exceed more than $10,000. Therefore you are not utilising the leveraging aspect of CFDs. However, you will get opportunities to short which you wouldn’t with a standard share trading account with no leverage. The same is true with Forex leverage. The challenge most traders have is they believe using leverage in a ‘small’ way when trading Forex is a waste of time. For some reason, traders want to ‘swing for the hills’ with their Forex account. Do not fall for this trap. Capital preservation is so important to be able to stay in the game. Either start off using zero leverage or a very small amount of leverage. When you start trading CFDs, you must keep your leverage extremely small. Always remember, capital preservation is key. Once you have your trading system and methodologies working, you can always increase your leverage as your money management allows. CFD leverage tends to get people excited, but only when they are winning. 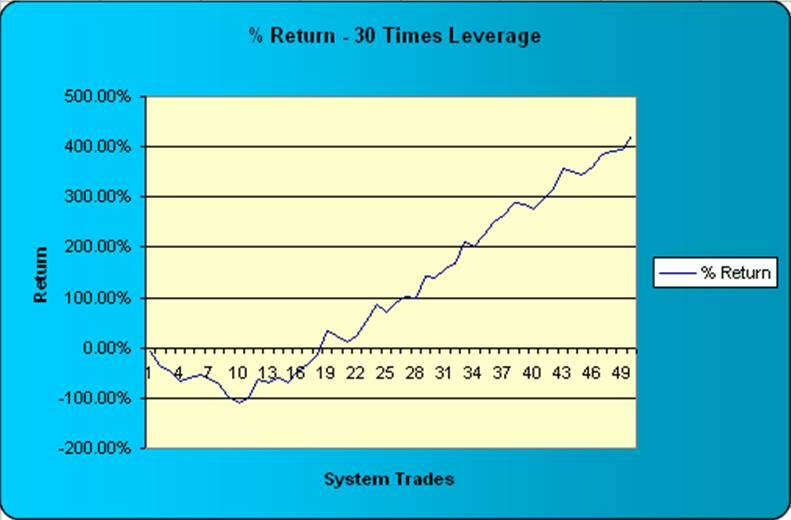 Let’s have a look at some rates of return for simple trading systems that use leverage. What is important to note is that profits are multiplied but so are the losses or what we refer to in trading terms as drawdown. NOTE: Each of the following charts illustrating a positive return is the same trades, just the amount of CFD leverage used differs. 1st Chart shows ZERO Leverage. 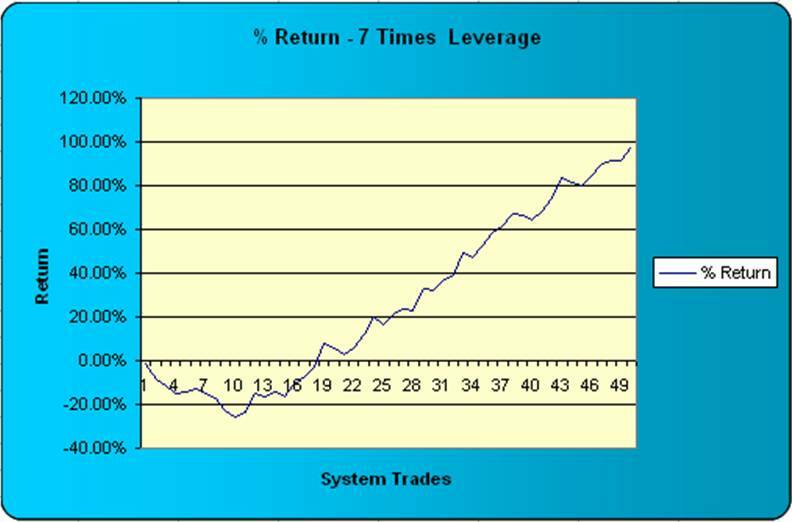 2nd Chart shows seven times Leverage. Equity Low point: -110.70% – You lost all your money. You can see in the 3rd chart that despite using a positive expectancy trading system, you can lose all our money if the CFD leverage is too high. This serves as a fantastic example of the importance of controlling your CFD leverage. It truly is the key to staying in the game longer and if done correctly, allowing you to survive the inevitable drawdowns. Below are some of our recommended all time classic trading books you must be read. You will be taken straight to Amazon.